Gravel Stabilizing grids help to keep gravel from migrating across surfaces such as driveways, walkways, roads and parking lots. The cellular structure of these grid products trap the gravel in it's structure and while providing stability for the surface above. There are multiple styles of gravel stabilizers available composed of both soft and rigid material. Gravel driveways require more maintenance than your standard pavement types but are also can be a great deal less expensive. Also, over time, gravel driveways create ruts and by filling the ruts with new gravel will not make the problem go away. To adiquatly limit the amount of gravel migration occuring on the surface a high quality gravel stabilizer must be incorporated into the gravel dreiveway. The layers beneath the top layer of gravel are what will provide your driveway's stability and support. Therefore, you must properly prepare the bed for the gravel. The best solution for a stable driveway will include digging 8 to 12 inches below the surface of the driveway, the removal of roots and other plants and then compact the soil with a plate compactor or roller to create the sub-base. Then, put down a 4-inch layer of coarse gravel on top of the compacted sub-grade layer. The top layer of gravel should be placed only after the sub-grade and sub-base are in place and compacted. If your sub-grade was properly prepared but your driveway is deteriorating, you might want to place down a layer of geotextile driveway fabric on top of the sub-grade layer and then place down the gravel. 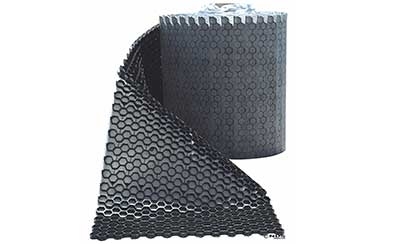 This fabric is an excellent solution for keeping your sub-base and surface gravel layers separated from the sub-grade level that will significantly reduce forming of potholes and ruts. This permeable fabric lets water drain from the surface to the sub-grade soil. Plastic stabilizer panels offer the same layer separation abilities as driveway fabric but will also keep the surface layer of gravel in place, preventing washout from the driveway. These panels consist of rigid and honeycomb structure. These panels are made from polypropylene and backed with geotextile fabric. The panels sit on top of the sub-base, then the surface layer of gravel is put on top of the panels. The gravel fills the honeycomb and is locked in place. The honeycombs will also take on some of the vehicle's weight, decreasing the potential of ruts and potholes. 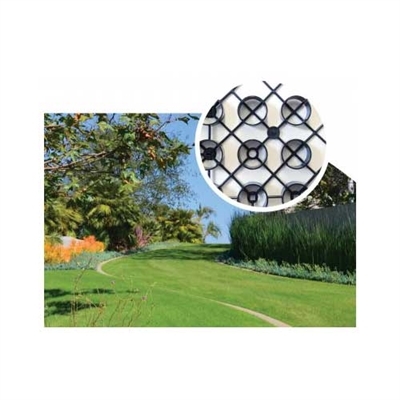 Manufactured in rigid 24” square panels, Tufftrack Grassroad Pavers provide maximum strength. With a compressed strength of 81,744 psf, these pavers will stabilize gravel in order to support heavy vehicles such as fire trucks. NDS Tufftrack Gravel Pavers are made from 100% recycled HDPE and are a sustainable solution for high traffic gravel areas that are normally covered with asphalt or concrete. 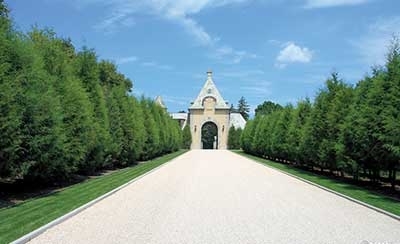 These gravel pavers decrease erosion while maintaining the look and functionality of gravel roads. They are made from 100% recycled materials and will minimize surface water runoff, providing an attractive, sustainable alternative to concrete and asphalt. Service roads, jogging tracks, golf cart paths, bike paths, truck and car wash areas, boat and RV parking and access and residential driveways. Other uses include; parking lots, roadway shoulders, fire lanes, emergency vehicle access road, equipment yards, truck maintenance yards, and construction entrance soil stabilizers. Along with the above uses, EZ Roll Gravel Pavers are also an excellent alternative for erosion control on slopes and in swales. DuPont technology has been leading the industry for many years. 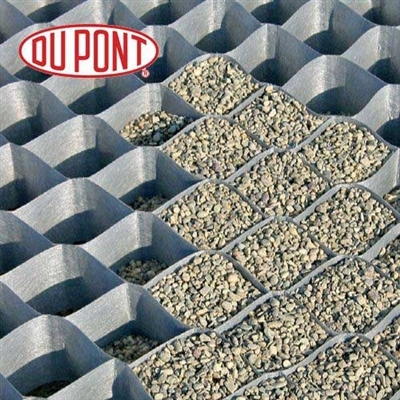 DuPont Groundgrid is no exception, it is a geotextile grid that is used for ground stabilization for landscapes and construction projects. It is a three-dimensional honeycomb design holds mineral infill to create a very solid surface. Just expand the three-dimensional honeycomb structure then place it on your project's surface and fill with gravel, sand, soil, or other materials to produce a strong, stable surface. Using DuPont technology, Groundgrid offers an unusually strong, stable surface for a job site. Like other ground stabilization systems, the three-dimensional honeycomb structure holds mineral infill to form a solid surface. 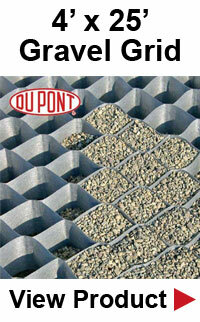 DuPont Groundgrid is made from high-performance fabric created by the experts at DuPont. It's lightweight but also tough enough to last for decades in any condition. It is also extremely flexible and very easy to use. Performance-wise, it lets water flow in a horizontal direct through the structure to prevent water from building up around the pathway. 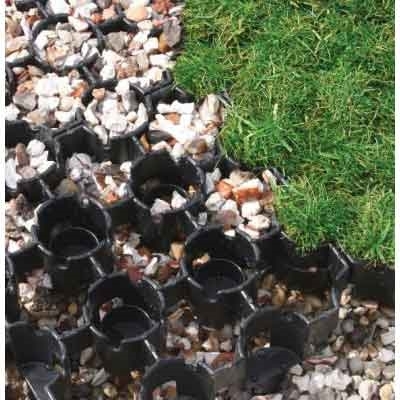 This is a ground-reinforcing paving grid system that is made from recycled HDPE plastic. TYPAR Bodpave 85 paving grids interlock with each other to produce a strong, stable surface that can handle heavy vehicle loads. 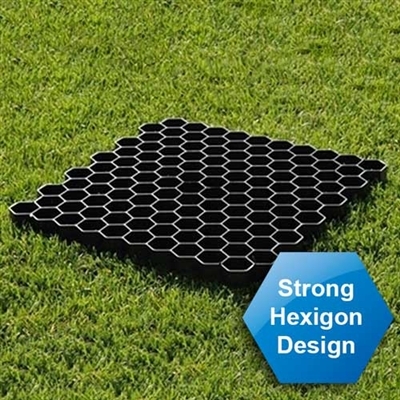 The porous paving grids can be filled with gravel, grass or soil to create a gravel or natural grass surface. Regular traffic areas for both vehicles and pedestrians, overflow grass parking lots, golf cart paths, fire truck emergency lanes, wheelchair and handicap paths and grass driveways. It can be installed with a grass or gravel filled surface, depending on the requirements. Grass and gravel reinforcements are used for parking lots, fire access lanes, utility lanes, and emergency access lanes. You need to apply a reinforcement that is extremely durable and can withstand time. Typave 25 is the latest U.S manufactured, this porous paver is made from recycled plastic materials that meet LEED highest ratings. Leadership in Energy and Environmental Design is a certification program that focuses on new commercial building sites and has a rating system. This plastic paver is developed to deal with reinforced surfaces for H25 loading specs., while protecting grass surfaces. TYPAR Typave 25 Gravel Pavers are composed of Quick-Snap joints between the sections, providing a very strong structure that can be staked into the ground to prevent breaking or slipping. Edge restraints form a barrier along the edge of driveways keeping the gravel where it is supposed to be. You do not want a high-profile or edge along the sides, a slightly concave or humped concrete curb will reduce gravel traveling out of the driveway. There are so many new products for driveways, paths, construction sites as well as for supporting heavy trucks and vehicles. With new technology, these products are also environmental friendly because it prevents materials ending up in landfills. Recycled materials are offering many great options for your all your ground projects. From fabric to plastic to pavers and edge restraints, technology will continue to make all your projects easier to carryout while providing a long lasting finished product.